This is the first painting I made especially for the exhibition 'Along Your Street' which took place at Byard Art on King's Parade from 31 May to 1 July 2018. Most trips that I make into Cambridge include cycling down Trinity Street. It is small street with one way traffic and curves past St John's, Trinity and Gonville Caius. It also has a great bookshop, Heffers and a few nice restaurants. You can be forgiven for missing the tree outside Trinity. 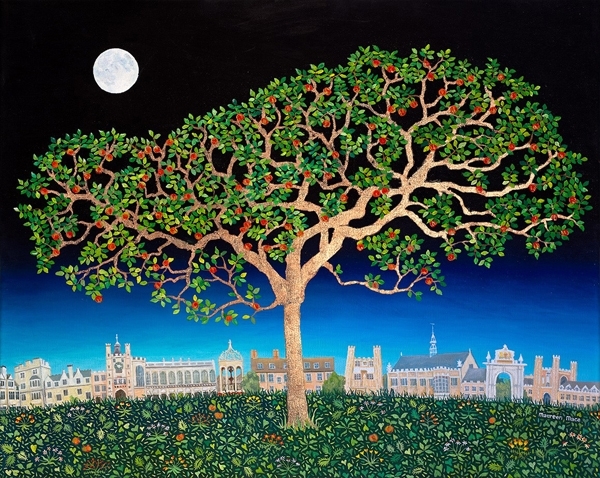 It is said to be a descendant of the apple tree that Isaac Newton studied when he wrote about his theory of gravity, but that tree was in his mother's garden in Lincolnshire! The tree outside Trinity rarely has any apples although at times students add plastic ones, it may be because there is not another apple tree close by to pollinate it. The tree is a lovely shape but the trunk is very thin. My version has the trunk in splendid copper leaf but as it is lost in front of the old wall I have shown it towering over snippets of Trinity College such as the gatehouse, the chapel and the library.